If you have some DVD movies, you may want to rip DVD to MOV on Mac OS X(Yosemite/Mavericks) so that you can play them with QuickTime, enjoy them on Apple's iPhone, iPad, iPod, tec., or edit the video files in programs like iMovie, Final Cut Pro. In this article, you will learn how to convert DVD to MOV on Mac with the video quality reserved. To finish your work, a DVD ripping program is needed. Here the EaseFab DVD Ripper for Mac is highly recommended to help you rip DVD movies to MOV format with fast speed and high output video quality. In addition to MOV format, it can also rip and convert DVD to all other regular video formats like MP4, M4V, MPEG, MKV, FLV, AVI, WMV, 3GP, VOB, etc. If you are using a Windows (including Windows 8/8.1), try EaseFab DVD Ripper Windows to convert DVD format. 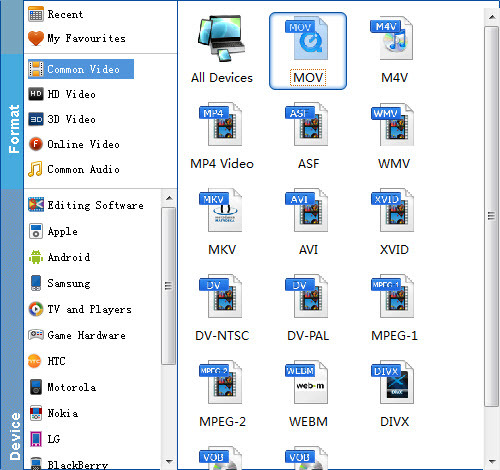 Now download the Mac DVD to MOV converter and follow the tips below to finish the conversion. Note that the quick start guide below uses DVD Ripper for Mac screenshots to show you how to convert DVD movies to MOV on Mac. The way to do the conversion in Windows (Windows 8/8.1) is almost the same. Just make sure you've downloaded the right version. After installing the program, launch it and insert the DVD disc you want to rip into the computer's hard drive. After that, you can click "Load DVD" button to add DVD movies to the program or directly drag the DVD icon from your desktop to it. Note that IFO/ISO files and DVD Folder are also supported. Click the "Profile" drop down list to select "MOV" from "Commoon Video" category as the output format. If you want to convert DVD files to portable devices, this Mac app offers a variety of presets for iPad, iPod, iPhone, Apple TV even apps like iMovie. When all the setting are done, click the Convert button to start converting your DVD files to MOV. The conversion speed is fast with the accelerating technology. When it completes, the destination folder will open automatically can you can find the high quality MOV videos. After that, you can either play the videos with QuickTime/iTunes or sync them to your Apple devices for playback anywhere you go.